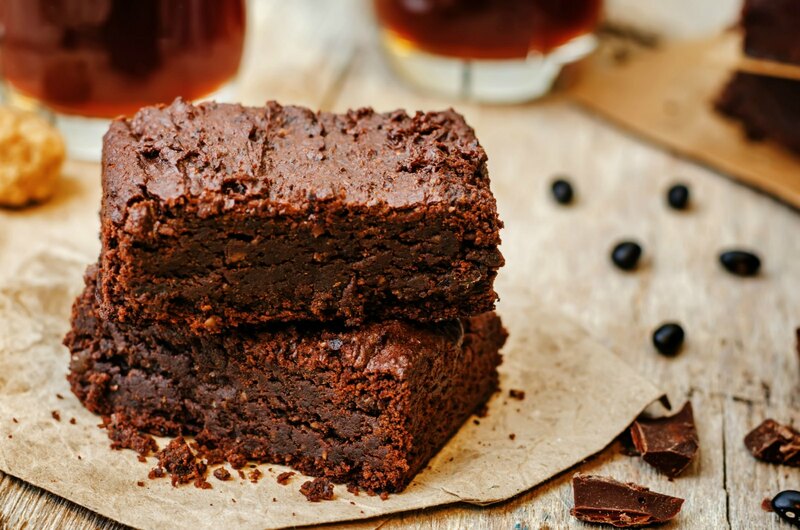 These healthy vegan brownies are created with two unusual and wholesome ingredients. Cooked black beans replaces most of the flour and avocado replaces the oil component. What you end up with is a fudgy, delicious, dairy-free, gluten-free, oil-free brownie. There are many ways you can make these healthy vegan brownies your own. You could add chopped walnuts or non-dairy chocolate chips. You could also replace the maple syrup with 3/4 cup of vegan sugar for a sweeter brownie. Whatever you decide, no one will ever guess that they are eating a black bean avocado brownie. I call it desserts with nutritional benefits! If you make this recipe, please leave a comment below and rate these healthy vegan brownies. You could also snap a photo and post it on Instagram using the hashtag #ordinaryvegan. And of course, be sure to follow Ordinary Vegan on Instagram. You can also join our health and wellness community on Facebook. There are over 316,000 healthy, vibrant community members waiting to embrace you. Finally, many people in the wellness world are turning to cannabidiol, commonly referred to as CBD. You can now purchase safe and effective Plant-based CBD Oil made from Hemp from Ordinary Vegan. Link here. These delicious, fudgy, healthy vegan brownies have two secret ingredients. Avocado instead of oil and black beans instead of flour and don't worry, you would never know black beans were an ingredient. Also, some people prefer these sweeter and use vegan sugar instead of the maple syrup. Lightly grease a 9 x 9 baking dish and line the bottom with parchment paper. Add all the ingredients except the optional add-ins to a food processor. Puree for approximately 2-4 minutes. You want it smooth and it will be thick. Evenly distribute the batter into the baking dish. Bake for 30 -40 minutes or until the the top is dry and the edges start to pull away. Remove from oven and let cool for 30 minutes before removing from the pan. Store in an airtight container for a couple of day or refrigerate to keep longer. *Two flax eggs can be made by combining 2 tablespoons of ground flax and 5½ tablespoons of water. Put into the refrigerator for 10 minutes to thicken. Thank you for stopping by Flora and for being part of our healthy community! Hope you enjoy them Diana and thanks for being part of our healthy community! Thanks Grover for taking the time and letting me know, and thanks for being part of our health & wellness community! Thank you so much for sharing this recipe. I am completely in love with these brownies. They taste amazing and super delicious. All my non vegan friends loved them as well and couldn’t get enough of them. I’m making these now for a group of church folks who are meeting here. Can’t wait to taste them myself and see how others respond to them. Hi Marley – I hope they enjoyed them. Thanks for stopping by and for being part of our healthy community! Just made these! I’m excited. I haven’t had brownies in a very long time! Hi Edna – Hope you enjoy and thanks for stopping by! Omg! They came out delicious! Hi Jaime – I am so sorry that they didn’t work for you. I know how frustrating it is to make a recipe, not like it and waste all those ingredients. So many people have enjoyed the brownie recipe (see below) but like all food, not everything is for everybody. Thanks for your feedback and for being part of our healthy community. Love the idea of using chick peas Rachael. Thanks so much for taking the time to share. I appreciate it! Thank you so much for this amazing recipe! I used a 19oz can of beans and sprouted spelt flour. The brownies came out great, my whole family enjoyed them very much. I was looking for an oil-free recipe and using the avocado instead is brilliant! I appreciate the feedback and thanks for stopping by Christine and thanks for being part of our healthy community! Hi Tanya – Thanks for the feedback and substitution ideas! And thanks for being part of our healthy community! Hi I made these Brownies and they didn’t cook in the oven, the whole mixture was hard from the top and runny inside. Ugh – oh no Simren! all those wasted ingredients. I don’t know – this is the first problem anyone has had with them. Sounds like too much liquid – Did you drain the beans? These were so delicious and are honestly my new favorite healthy vegan brownie recipe! My sister and I are tempted to eat the whole pan lol! Thanks for the awesome recipe. I will definitely be making these again! Hi Taylor – thank you so much for taking the time and letting me know and I am so happy you loved them! The fam likes them but they definitely taste like black beans! Hi Rachael – Thanks for your feedback and for being part of our healthy community! Hi Seonaid – Yes you can freeze them. Hope you enjoy and thanks for being part of our healthy community! Hello, I cant wait to make these today. Great for a snow day! I have a question Nancy, can I use Bobs Redmill egg replacer instead of 2 flax eggs? How much , would it be the equivalent to 2 eggs? I listen to your podcast mostly every day, even have listen to aome of them 2 or 3 times. You are a well of knowledge, thankyou for being a blessing. Hi Kim – Thank you so much for saying that – I so appreciate your kind words and your support. Bob’s Red Mill is the same ratio – use 2 tablespoons of Bob’s and whisk it with 5 1/2 tablespoons of water – that will be the same as two flax eggs. Hope you enjoy them!